Exfoliation of the skin is a natural process during which dead skin cells are released from the stratum corneum of the epidermis and are replaced with new cells from the basal layer of the epidermis where cells are replicated. Until about the age of 30, skin cells turn over approximately every 28 days. This natural exfoliation process decreases as we age contributing to fine lines, wrinkles and a dull, dry appearance. This is where exfoliation treatments come into play, by increasing desquamation in a controlled manner. Regardless of the exfoliating method, the results are typically a more refined, smoother appearance. With regular exfoliation, a more even skin tone, reduction in fine lines and overall more youthful appearance may result. Skin be exfoliated either manually or chemically, and there are many examples of both. Manual exfoliation is the use of a superficial product or device to remove dead skin cells. Chemical exfoliation is the use of an enzyme or an acid to either break apart keratinized cells or to dissolve them. This article will focus on mechanical exfoliation techniques through devices. Clients can manually exfoliate their skin at home with a scrub, abrasive pads or brushes. There are different facial scrubs that contain granules of certain nuts, jojoba beads, salts, sugar and other substances with a granular texture. When these topical home care products are used, they are often recommended twice a week. There are also manual buffing pads on the market that can be irritating to the skin, especially when over used. One of the most popular forms of home exfoliation is the use of mechanical cleansing brushes, which offer a safe, easy-to-use exfoliation method with a low risk of side effects. Mechanical exfoliation treatments most commonly used by an esthetician are microdermabrasion, dermaplaning, and high-pressure saline exfoliation, which will be discussed below. As newer technology that is constantly arising is the use of “wet microdermabrasion” devices, simultaneously delivering a topical product to the superficial layers of the skin. Many of these topical products include hyaluronic acid to hydrate and soften the skin; others include skin lightening agents, antioxidants and even mild chemical exfoliants. Clients love the feel of these devices. They can feel the skin being scrubbed while a refreshing stream of liquid is being brought out through the hand-piece. Dermaplaning is a great treatment on its own, but is also commonly used as a prep before other esthetic treatments including superficial chemical exfoliation, LED, ultrasound or as an add-on to a facial. In cosmetic medicine, it is often used to compliment medical treatments, most commonly as an adjunct to non-ablative laser treatments to remove pigmentation that comes to the surface. Other indications for treatment include dry or dehydrated epidermis, fine lines and wrinkles, acne grades I and II and vellus hair removal. Clients that have an excess amount of vellus hair particularly like dermaplaning for the smooth texture that occurs after the hair removal. This hair can also trap dead skin cells and oil in the follicles, resulting in clogged pores. Therefore, removing the hair gives the patient clearer, healthier skin. This is also a great treatment to offer clients that are pregnant or nursing looking for a more effective exfoliation method while they cannot use exfoliating acids due to the risk of certain chemicals being absorbed into the blood stream. There is no downtime associated with this procedure, unless a superficial nick or scratch appears. 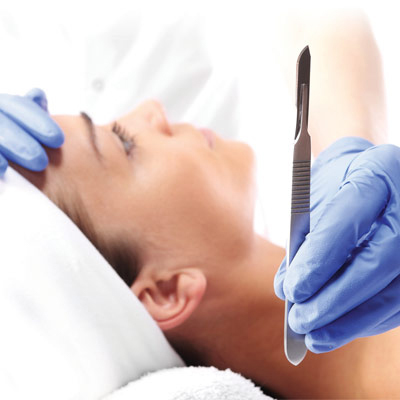 Dermaplaning is most commonly performed on a monthly basis, but can be done as often as every two weeks. There is a low chance of adverse effects when the technician is properly trained and practices safe measures. Although merely an old wives’ tale, many patients are often concerned that the hair will grow back heavier and darker after dermaplaning. You can calm your client’s fears, and tell them that shaving cannot change the structure and function of the hair. It will grow back at the same rate and texture as before the treatment. It is important to warn the client that their hair may feel blunt when the hair initially grows back. This should not be confused with extra hair growth. Clients see the most benefit when using a customized skin care regimen to address any underlying concerns. High-pressure saline exfoliation uses a high-velocity spray gun to apply sterile saline solution and compressed oxygen on the skin. The pressurized stream of saline exfoliates the superficial layers of skin while increasing levels of hydration. The oxygen component helps to revitalize the skin and fight bacteria associated with acne. There is also the option of infusing helpful ingredients with specialized topical products, including antioxidants, hydroxy acids and anti-inflammatory ingredients. Clients love the feel of this treatment, similar to the feel of wet microdermabrasion. The biggest difference between the two treatments is that the high pressure saline is performing the exfoliation. With the wet microdermabrasion, it is the diamond tip exfoliating the surface. The results for revitalization are often seen after one treatment; however, a series of six treatments spaced four weeks apart is recommended to reduce the appearance of fine lines, even skin tone and texture, and overall provide a more youthful appearance. This treatment is sure to become highly sought after by estheticians and consumers. Some are saying it is similar to “pressure-washing” the skin. The high pressure saline can be used on all skin types with the exception of overly inflamed or sensitized skin and of course the presence of any open wounds or infections. The variety of devices and means of exfoliation can make it difficult to choose which method to use. Each of these methods has their pros and cons; it is up to the technician to decide which is best for them and their clients. When choosing a device, research several distributors. A good rule to follow when choosing any device is to examine at least three companies. Make sure the company offers a warranty, call other customers for feedback on customer service and find out the cost of consumables including maintenance on the device. Estheticians are allowed to work on the non-living superficial layers of the epidermis in most states; however, check with your individual state regulations before performing any of these exfoliation methods on clients. Overall, it is important that whatever treatment you provide gives the client expected results.